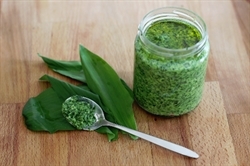 We are deep into Wild Garlic Season now and a great way to enjoy it is as a pesto. 1, we have a handy recipe bag, with Wild Garlic, hard parmesan style Twineham Grange Cheese, Walnuts & instructions (and recipe card) - you just need to have some Rapeseed Oil to hand as well. 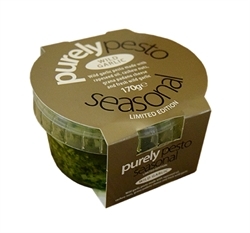 2, you can just have a pot of Purely Pesto's Gavin, own expertly made version - he used Cashews instead of Walnuts - and it is delicious! 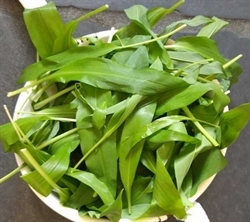 3, just brag a bag of Wild garlic leaves - choose your oil, some nuts, hard cheese and perhaps some lemon, and experiment yourself!